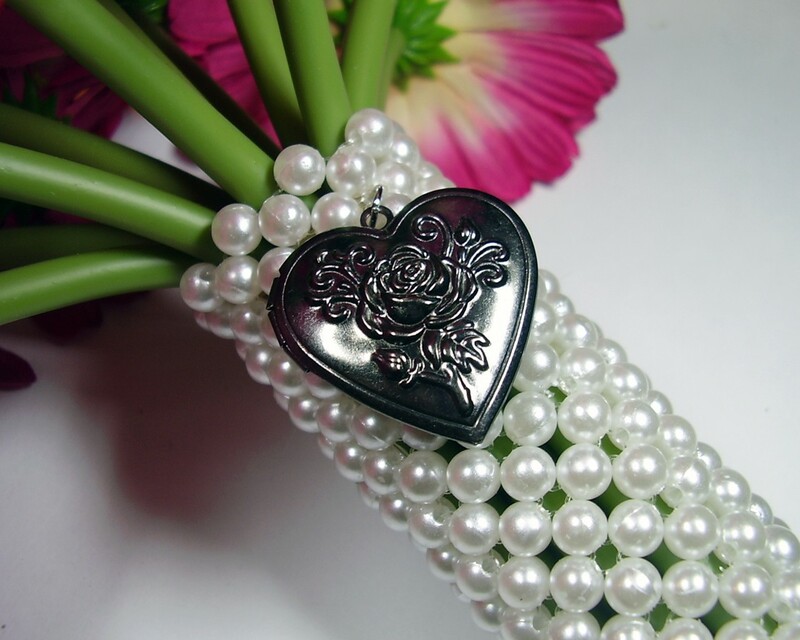 i have a personal affinity with pearls. they’re naturally romantic. i love the sheen, the different colors, and the sophistication of pearls. often when we think of pearls and weddings you think maybe a pretty necklace, some earrings, maybe some accents on your dress…but what if you took it another step? make the pearls the focus, not the accessory. the wreath above is just a styrofoam circle with different shades and sizes of pearls hot-glued on. it may be a little time consuming to make but can you picture them hanging from the door at the chapel? or hanging on your chair at the reception? 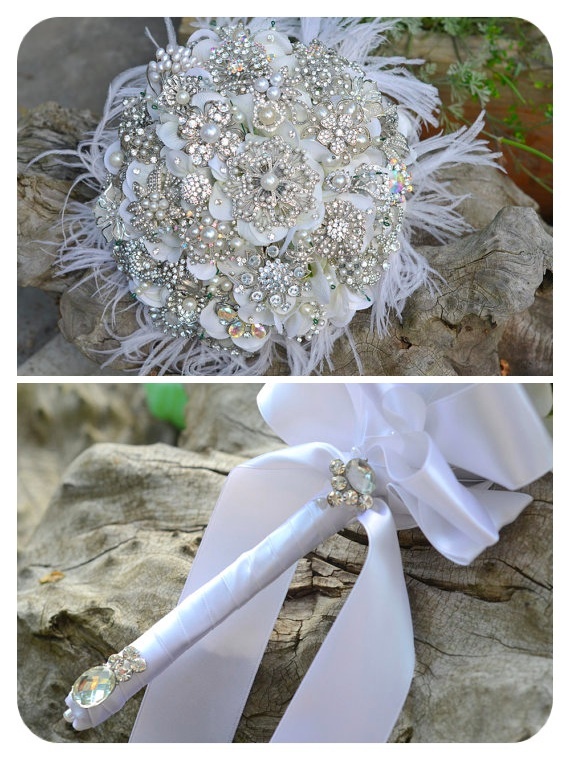 this photo inspiration used pearls, glitz, and feathers instead of flowers as the birdal bouquet. so chic and eleg ant! not quite sure you want to give up your floral bouquet but like the idea? 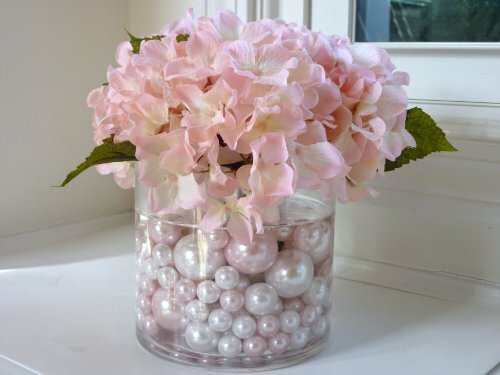 use pearls to wrap the stems of your bouquet. 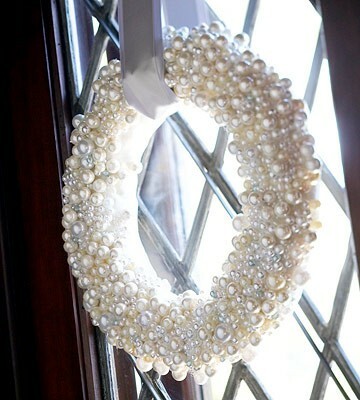 another magnificent way to use some pearls in your decor? string some pearls thr ough your centerpiece arrangements or use pearls as a base for your flowers to float in like in this inspiration photo. 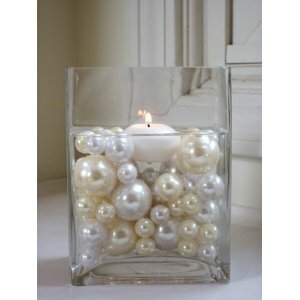 or put your votive candles in a bed of pearls. this inspiration photo used the pearls to float candles, however, i’m not sure i love this particular use. but picture tall cylinder vases of different heights, all full of shining pearls. now that would look lovely. 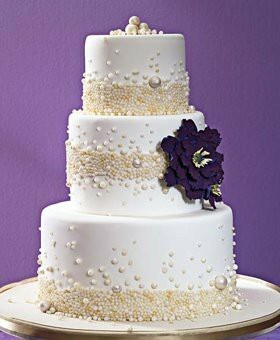 and finally, pearl cakes are increasingly popular. thanks to pinterest and lovely ladies sharing their ideas and creations, i found these absolutely mag cakes. don’t you love? they’re so beautiful i almost can’t stand it. 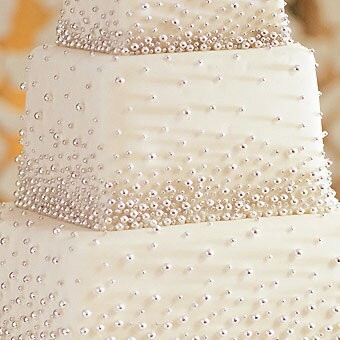 pearls are already bff’s with weddings and brides so go a bit overboard and use them in different ways. as always, elle courtney is thrilled to help you come up with new and creative ways to display your unique ideas and inspiration. we’re looking forward to talking to you!